WE CURRENTLY TAKING RESERVATIONS ONLY 45 DAYS IN ADVANCE!!!!!!!!! 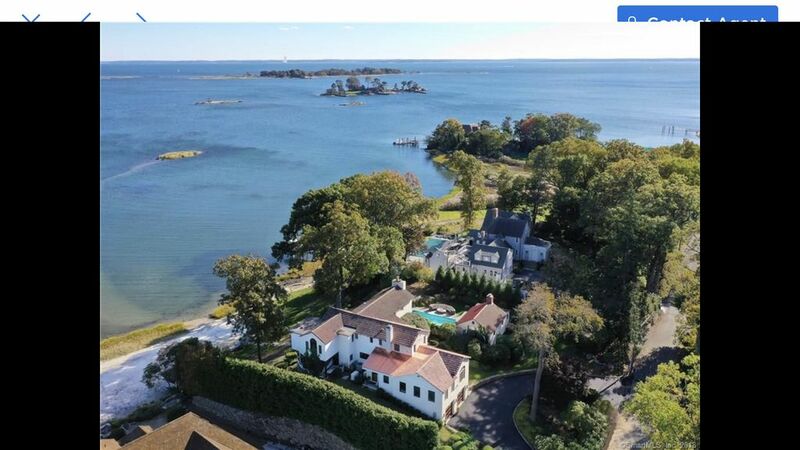 Boasting 172 feet of direct waterfront, a private beach, a cabana tiki bar, pool and beautifully remodeled pool house, this meticulously renovated 6 bedroom, 5 bath home is one of the most spectacular coastal estates in the area. Found in the private Wilson Point Assoc. which offers private tennis courts and a second private beach, this house has left no stone unturned. At low tide, the beach expands into an amazing sand bar while at high tide, one feels that they are enveloped on a private island. No expense has been spared in the multi-year Mediterranean remodel. Its natural wooden beams, arched doorways, wood detailing, plaster pillars and walls, numerous fireplaces, marble baths and inlayed brick and wood flooring are just a few of the elements that make this house unparalleled and give the home its warm & inviting ambiance. Each room is exquisite in its own right, a wood paneled ceiling in the office complemented by parquet floors, hand-painted accent walls in the bedrooms, beautifully crafted and utilitarian built-ins, a kitchen featuring a sprawling island fit for a chef and wrought iron framed balconies overlooking the water. The entertaining options are endless with the expansive floorplan, beach bar & pool house which is complete with a full bath, laundry and kitchen. Wonderful house with breathtaking views. Up on a hill overlooking the sound (and a private beach). House had everything. 10 minutes to the train and I-95. Our family had a wonderful stay with 3 generations on the porches, by the pool, on the beach and out in the water (either on the sandbar or on the kayaks.) Owners were responsive and wonderful. My wife wants to move here. For additional maid service our trusted personal is available $30/hour on a daily basis. She would clean bathrooms kitchen, vacuum etc take trash out, change sheets ,towels etc.